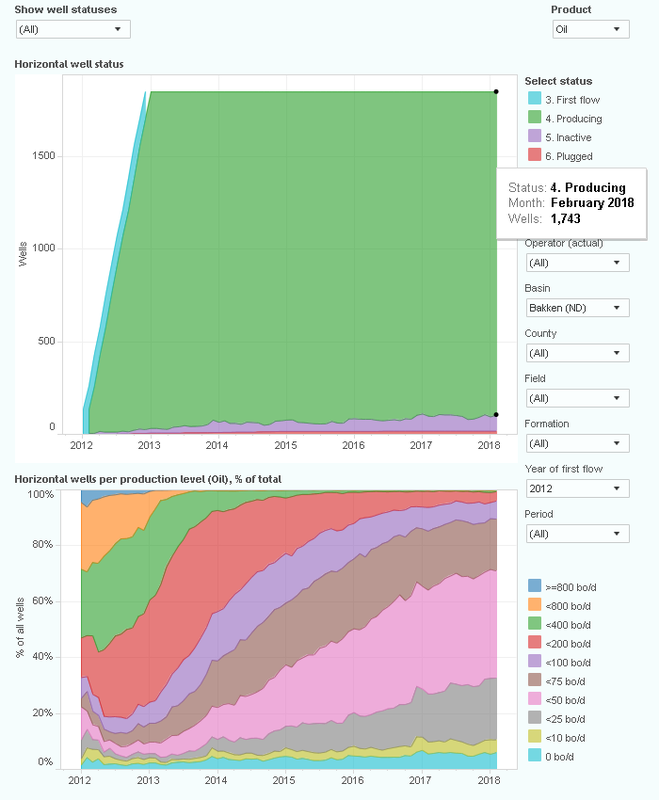 This interactive presentation contains the latest oil & gas production data from all 13,253 horizontal wells in North Dakota that started production since 2005, through February 2018. February oil production in North Dakota came in at 1,175 kbo/d, after another small month-on-month drop of ~0.5%. 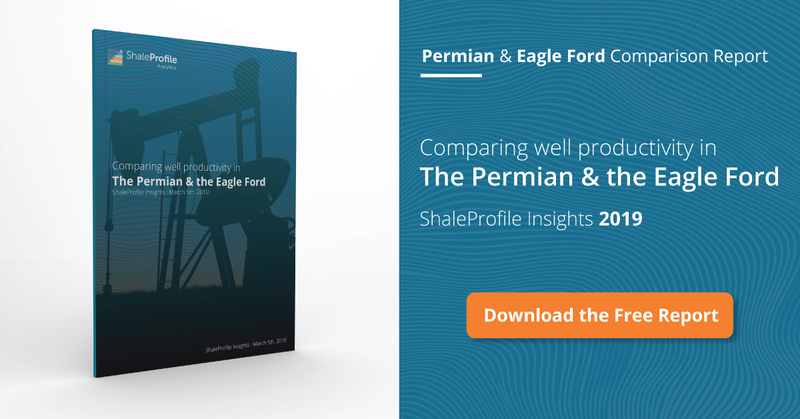 Completion activity in January & February was low, with just 60 and 71 new wells brought online respectively. The number of DUCs has almost stayed constant compared with a year ago (800 vs 806). Gas production rose by double the growth rate of oil in the past year (22% vs 11%), to over 2 Bcf/d. You can see this if you switch the ‘Product’ selection to ‘Gas’. In the ‘Well status’ overview the status of all these horizontal wells is shown over time. In February, the number of wells that were not producing (‘inactive’) rose to a new high, although it is typically at an elevated number during the winter months. Whiting, which is the 2nd largest oil operator in the region, produced the lowest amount of oil in more than 5 years, at just over 100 thousand barrels of oil per day (see the ‘Top operators’ tab). This “Ultimate recovery” overview shows how all these horizontal wells are heading towards their ultimate recovery, with wells grouped by the quarter in which production started. Improvements in initial well performance are clearly visible here. Especially the wells that started in Q3 2017 had an excellent start, as shown by the light blue curve at the top, as they produced 107 thousand barrels of oil in just the first 6 calendar months. But if the wells in the years before are an indication, it does appear that the decline after the first 1-2 years is a little steeper than before, hurting ultimate recoveries. This is for example visible if you compare only the 2010 and 2016 vintages using the ‘Year of first flow’ selection. This may be related to the increase in gas production, which is shown when you select ‘gas’ in this overview, or view the 9th dashboard (‘Gas oil ratio’). The blue curve in the bottom graph in the latter one shows that the average gas / oil ratio in the basin has doubled in the past 7 years. By Tuesday next week I will have a new post on the Niobrara region, followed with an update on the Eagle Ford. If you missed my post on a projection of future oil & gas production from existing wells earlier this week, you can still find it here. Do you ever look at updating the total number of wells producing in later years to reflect dead wells? For instance in the Bakken there are only 1252 wells left producing from 2011, and 1823 from 2012. I know there are many reasons for wells to go off line but I always think it is interesting that these wells that are supposed to produce for thirty years start can have a percentage start to get plugged after only a few years. In the ‘Well status’ overview, after e.g. selecting wells from 2012 using the ‘Year of first flow’ selection, you will see an overview like shown below. In the top graph you can see that of the 1847 hz wells that started in 2012, 1743 were still producing last February, 87 were inactive, and 17 were plugged. In all the overviews where the performance of this vintage is shown, I still include the 0 production from the inactive & plugged wells, as otherwise you would get survival bias (sudden jumps in performance when wells drop out of the group). The bottom graph shows more information about the production levels within this group, e.g. that in February 111 wells out of the 1743 were at 0 bo/d (which is a little higher than the 87 + 17 mentioned before, but 7 wells are still producing gas). Where are those 1 million barrel wells Ham was taking about? Don’t see any average year that will ever track to a 1 million barrels. Thank a lot for your posts and data base still very comprehensive and interesting. > Why do you exclude the wells (565 ) with no water production reported ? I realize that the wording in that dashboard my not be so clear. For these wells, the problem is that water production is not reported at all, due to confidentiality (they are all likely to produce water, we just don’t know how much).